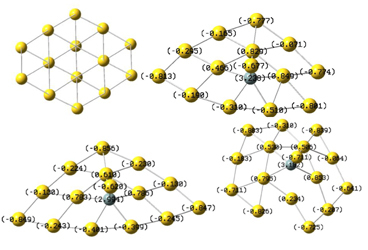 Clusters of pure gold comprising of more than 14 atoms do not adopt planar arrangement. However on doping with a single Si atom, quasi-planar structures of AunSi clusters (with n = 14 – 16) show up as low energy isomers, though it may not be the stable ground state. The calculations have been performed within the framework of DFT with spin-polarized generalized gradient approximation (GGA) implemented with Gaussian-03 code. In all low energy isomers of AunSi we find a Si-Au dangling unit sitting over the quasi-planar arrangement of gold atoms. Therefore planar arrangements of gold atoms is possible beyond the size n=14 with the aid of silicon. A pentagonal unit of gold atoms attached with a Si-Au dangling unit can only exist in the presence of other neighboring gold atoms to support the planarity or quasi-planarity. Mulliken charge distribution analysis reveals that a symmetric charge distribution accompanies this unusual planarity of gold cluster beyond size n=14.